I feel sorry for the lonely rutabagas sitting on the shelf at my grocer. No one ever seems to buy them, as evidenced by the checkers’ bewildered query, “turnip?” when I pick up a few for the week. They’re surprisingly good, usually fairly cheap and a good replacement for potatoes. Plus, they contain less than half the calories of a similarly sized potato. I’ve never been much of a fan of mashed potatoes. Often they’re too pureed and textureless for my taste, and mashed potatoes with just potatoes need too much butter and salt to make them entertaining to eat. So, I started experimenting. First, I had some leftover baked potatoes, so I mashed those up roughly with a bunch of different foods: bacon, leftover chard, dill, leftover roasted garlic, leftover broccoli… See a pattern? It made a fantastic lunch and I started reconsidering my mash. I still prefer the texture of mashed pre-baked potatoes to boiled, particularly since many mashed potatoes are simply too “wet” for me. I’ve already talked about Beet Green & Bacon Garlicky Mashed Potatoes, which turned me on to the wonders of beet greens. Still, did it all have to be potatoes? The answer is: Not really. We tried out substituting cauliflower for half of the potatoes. Turns out, it provides good texture and flavor without detracting — and reducing the calorie count considerably! It’s also an excellent way, I believe, to sneak in an extra serving of veggies for that recalcitrant veggie-avoiding spouse or kid. The cauliflower is just about indistinguishable from potato. Enter the humble rutabaga. When cooked, its softly yellow flesh is reminiscent of good squash if it were crossed with a potato. We already knew we liked it from the last beef stew we made, so since we had two leftover, it seemed a perfect candidate. Chop rutabagas, potatoes and squash into 1″ cubes. In a medium saucepot, bring water to a boil. Add rutabagas and garlic, return to a boil. Reduce heat to a simmer and cook for 10 minutes. Add potatoes, return to a boil. Again, reduce to a simmer and cook for 10 minutes. Add cauliflower and cook for an additional 5 – 6 minutes. All veggies should be tender. (Check just like making mashed potatoes with the tip of a knife. If it slides in easily, it’s ready.) Drain. Microwave the squash for 5 minutes. Saute the onion with a bit of salt and pepper in a tablespoon of oil until browned. 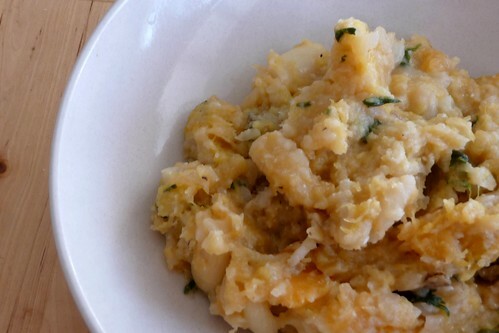 Combine cooked rutabaga, garlic, potato and cauliflower mixture with squash and fried onions in a large bowl. Mash together well. Add in green onions and bacon (if using), sour cream, salt and pepper to taste. Serve. Like mashed potatoes, this is just as good the next day. This entry was posted in american, one-dish, recipes, side, untranslated, vegetable, vegetarian. Bookmark the permalink. We threw in the squash because we had a little box of leftover cut-up squash that wasn’t enough on its own — you won’t miss it, I promise. :) Glad you liked the recipe!